← Patty Pioneers – Weiner eating a wiener. I Love My Cupcake Browser Theme. Which web browser do you use? There were several browsers I tried out in the past, but currently I’m sticking to Firefox. According to the stats as of December 2011, Firefox, Google Chrome, and Internet Explorer are the top three popular browsers in the list. I don’t consider myself as a digital native, although I was introduced to computers in kindergarten at school. We all had to play around with old Apple computers under the guidance of our teacher. Do you remember using “Netscape” in the earlier years of your cyberlife? It’s the green logo, remember? Maybe some of you do remember or know, maybe not. 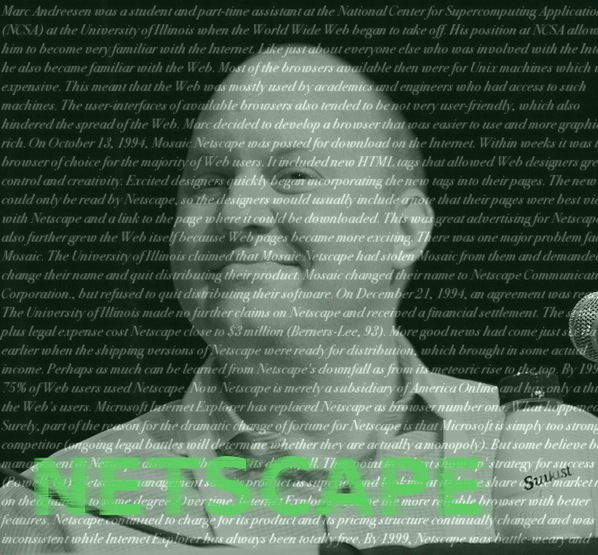 The DS106 assignment I did this time relates to Netscape and the founder of Netscape. The now multi-millionaire software engineer Marc Andereessen was a student and a part-time assistant of NCSA at the University of Illinois when he began his new browser development project. He was one of the second generation of the people who were introduced to WWW which Tim Berners-Lee created. However, at that time, the web browsers like Unix was expensive and they weren’t available for the general public. So Andereessen’s aim was to build a better user-friendly browser that everyone could use. As a result, he and his co-workers produced the Mosaic web browser. It was released to the public in the year 1993. There was a legal problem over the property of the Mosaic browser between the University of Illinois and the company Andereessen co-founded with his business partner. Mosaic had to be renamed to Netscape Navigator soon after its release. I didn’t know until I read the information on Andereessen and Netscape that Netscape was originally named Mosaic. As you may have recognized, Netscape exists, but it’s no longer a popular browser. Netscape engaged in the Browser war with Microsoft, which became interested in the Internet business and hopped on the bandwagon. Then, as you can see, Internet Explorer won the war and became the dominant browser in the market. Design Assignment: What the Font? A common exercise in design school, take typographical elements (perhaps even the words of a story) and bring them to life. Since we’re doing The Pioneers section, I wanted to continue on working on DS106 assignments with the pioneers theme. I don’t think I’ve seen an Andreessen post yet, and that is why I thought this article will be a good one to do. My design is a portrait unlike the rest of the posts that people have done. I wasn’t so sure how I would interpret the assignment mission, though there’s some typography essence in the image (the word NETSCAPE being blown away). Now I’ve become slightly more experienced with using the image manipulation application, the time spent for creating the assignment has been reduced than before. I’m also eager to try new things. ( The white caption in the background is taken from the familiar Pioneers page). Mosaic was definitely a huge leap forward for browsers. This post sent me on a 20 minute expedition searching for the name of an old browser I used to use on my grandmother’s Mac… Or maybe it was on Windows 95, I’ve forgotten. I don’t remember using the Mosaic browser, but I’m definitely sure all of the school computers had Netscape on them. That was back in 199…5 or 6, probably. I’m glad that we have more choices for internet browsers. Internet Explorer (and Microsoft) isn’t so friendly with Mac users. To answer your first question. I’m a big fan of Google Chrome. I’ve been using it ever since I got my MacBook in June and haven’t had any problems with it. It is also very convinient that my bookmarks update to my Android phone. I’ve read that the Windows version of Firefox has been running into problems lately but I’m not so sure. Forgive me for being so late in commenting on this. I remember seeing at the end of the pioneers section and just now remembered that this was on of the cooler ds106 assigments (disguised as an essay like blog post). I remember Mosaic well when it first became available. It was such an amazing thing to see a page with images and color appear from another computer on the other side of the country through the telephone. It was slow but it was a mind blower. I really like the image you came up with for this. Belated comments are always welcome. I have the tendency to write a lot and I sometimes upset my English professor. Am I digressing from the topic or what? Perhaps, yes. I had no idea what I was doing with the Internet back then, and since computer technology has been progressing rapidly, I never thought of the story behind its invention. It must of been a mind blower for me too, if I knew what I was seeing. What Awaits in Our Future.